Shinjuku Nishiguchi Omoide Yokocho is a street filled with restaurants where people have been frequenting since the 1930s. Most of the restaurants are izakaya (Japanese style pubs) and pubs, mainly serving various spirits and food such as yakitori (grilled chicken skewers). Torishige is one of the izakaya/bars that is worth noting and that’s what we’re going to introduce to you. You can reach Torishige by walking only 3 minutes from Shinjuku Station. Opening its doors in Showa 24 (1949), this izakaya is one of the oldest yakitori restaurants in Japan. The current restaurant’s owner is the 3rd generation and is actively developing new menus. Although the restaurant name includes the kanji of chicken, this izakaya mainly serves pork. There it’s always full of people, especially those who want to see how the owner cooks his food on the second floor. Shinjuku might be the only place that you can see a jam-packed restaurant like this. The restaurant is not small and has enough seating for 82 people. However due to its popularity, those seats are often already taken. It’s better to make a reservation if you want to visit Torishige. Torishige is famous for its uses of rare parts of the chicken. For example, one of the popular menu choices is chicken liver with lemon juice. Torishige carefully makes its own secret sauce by using only a few ingredients such as soy sauce and sugar and it tastes amazing. The true value of Torishige is extracted in this secret sauce. The best menu to finish your meal is their Shime No Zousui, which is rice combined with a flavorful soup that has sesame and green onions. We also recommend you to try some menu items like Ganso Piman No Nikuzume (Original Meat Stuffed Bell Pepper). Torishige is the right choice if you’re craving grilled pork and chicken in Shinjuku. Let’s Go To An Izakaya In Shinjuku! An izakaya is a restaurant that serves smaller dishes and spirits. Japanese people mainly use izakaya for drinking parties to celebrate a success or for events. University students also go there with their friends to get some food and drinks. Some izakaya are franchises and gain fans with their reasonable prices. Shinjuku is a bustling area that spreads out from Shinjuku Station. It has many izakaya streets including Shinjuku Nishiguchi Omoide Yokocho and Kabukicho. You can find hints of Showa era Japan from the appearance of Shinjuku Nishiguchi Omoide Yokocho. Due to its popularity, more and more international tourists have been visiting Shinjuku. 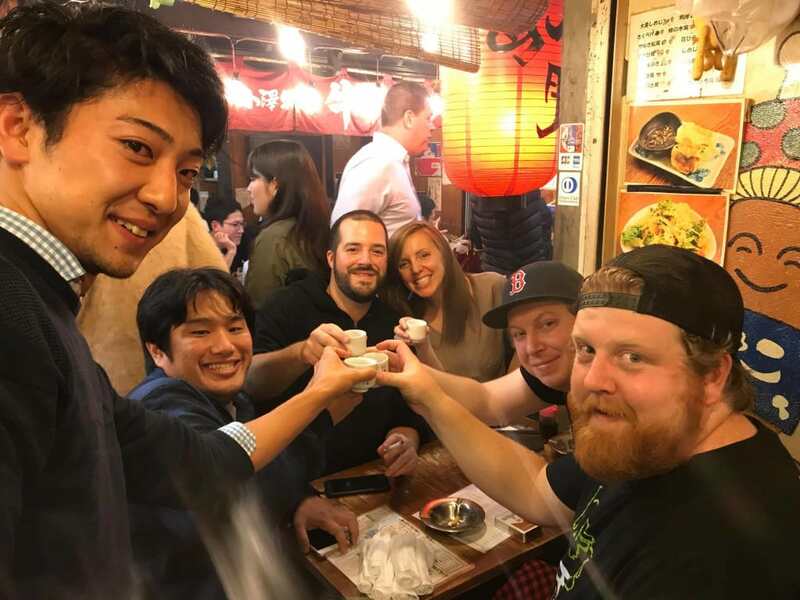 Experience Barhopping In Shinjuku With A Guide! In Shinjuku international tourists can sign up for Tokyo Bar Hopping Nightlife Tour. You can visits various izakaya in the Shinjuku Nishiguchi Omoide Yokocho area. We recommend to end your barhopping with the ramen noodle restaurant called Afuri.